of American culture in an academic environment that is safe, helpful and personal. 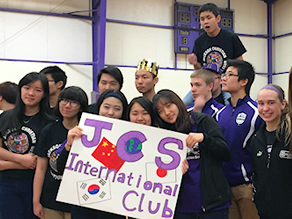 Jackson Christian School (JCS) has many years of experience with International Students from a variety of countries. Our understanding of the unique needs of International Students has led the school to develop a positive school atmosphere that allows students to grow in their understanding of both the language and culture in an affirming and family oriented environment. JCS American students are accustomed to interacting with students from many cultures which helps our International Students adjust more quickly. Tuition is all inclusive and there are no additional fees charged by the school. All academic courses and many social opportunities are included in the cost of tuition. Upon submission of the above documents, a Skype interview will be scheduled and conducted for a final decision regarding admission. Agencies who are interested in working with Jackson Christian School should direct their inquiry to Holly Stanton, International Student Director.